Tonight’s effort is going to be a somewhat abridged affair as I’m still trying to sort out the technical problems, although I think that yesterday and today now have maps. Last night as it was fairly warm we had the window of our bedroom open. At about 9:00 pm some bloke outside tapped on the window and made some unintellible noises. It is quite possible that these could have been friendly overtures but the tones didn’t sound particularly friendly so we hastily shut the window and, in the best British manner, pretended that nothing had happened. Last night I spent ages trying to get our mifi gadget to work with the French sim, no luck at all. The thing works in Italy and also in Britain with loads of different carriers. 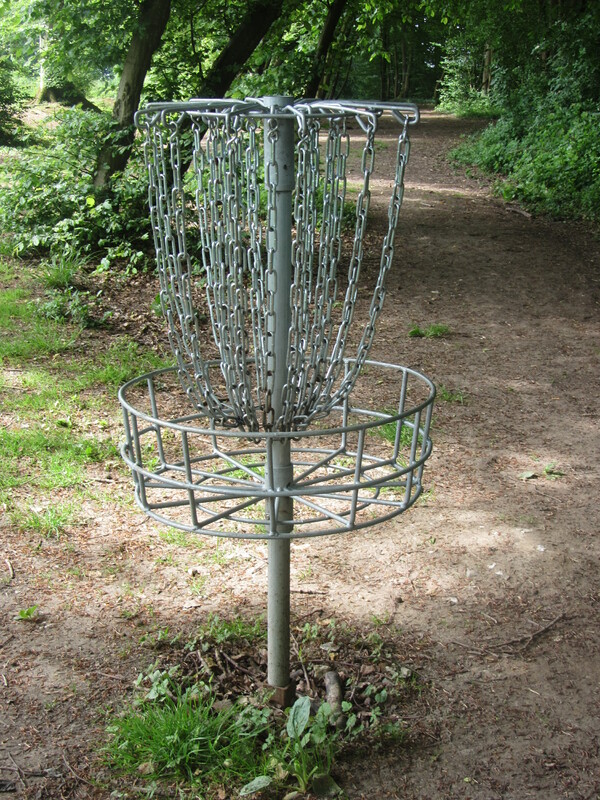 Here in France? Not a chance! The failure to get the mifi device working meant that instead of setting off for Ardres at a reasonable time this morning we headed into Calais centre ville again. In the France Telecom shop at one point there were five people trying to get the device to work. In the end they found an English speaking helpline and rang it for me. If the helpline they rang was a helpline which helped mobile users then I am sure that things would have moved forward smartly. Shame in many ways that it was for fixed lines only. My eager helpers gradually dwindled down to one bemused sales person who shrugged helplessly when all had failed and only raised shoulders and eyebrows were in evidence. We returned to our hotel at about midday and had a drink before putting on our rucksacks and heading towards Ardres. I have been using a small daysack so that I don’t have to have my large rucksack for shopping and so forth. today to save time I couldn’t be bothered to empty the thing and, instead, I lashed it to the outside of my rucksack. What a stupid, stupid thing to do! After about 5 miles I was in a state of desperation and dilapidation, the balance and weight of this illmatched pair were terrible. I should have stopped and sorted it all out but didn’t of course. We ate lunch in a very nice, inexpensive, restaurant. A very friendly, substantial, lady in charge. Delicious steak hashe de cheval with a portion of pommes frites as substantial as the lady in charge. 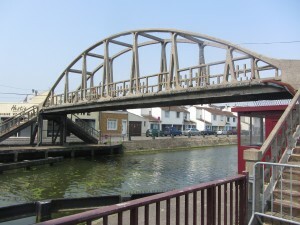 This part of France is full of waterways which simplified our choice of routes today as we could not criss cross the countryside if there were no bridges to allow such incontinence of purpose. We strolled on and on, and on and on, France is completely flat here so the roads and paths are arranged in long straight lines. 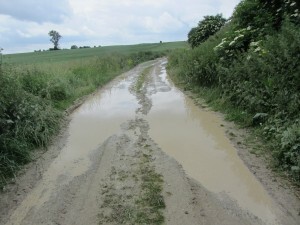 The good old rolling English road created by the good old rolling English drunkard has much to be said of it. Arriving in Ardres at about 5:30pm we had just about had enough of walking. 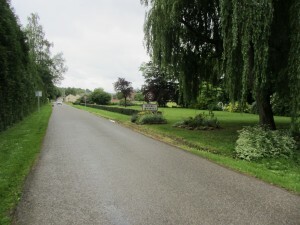 It had been hot and sweaty and, but for the French custom of free use of verges for convenience, it would also have been uncomfortable in the extreme. At last, Ardres, only another two miles to go. We found a bar and refreshed ourselves willingly, the owner telling us where we might find a bed. 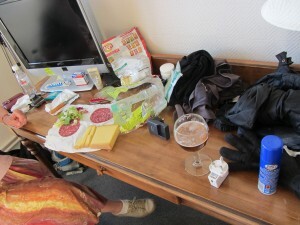 The hotel is comfortable and we have dined well this evening on traditional French food. The people on the next table were a mother and son. The son was about 40 years old and the mother? Who knows? The son told me, amongst other things over a glass of cognac, that he enjoyed flying model gliders and that he intended to buy a new one as the one he used now was old and tired. He also told me that he was getting a new wife as he had been married for ten years and the new woman wanted to learn how to fly model gliders. Tomorrow we are probably going to attempt to start strolling at 7:30 am, better go to bed I think. Yesterday’s stroll was largely enjoyed in the heat of the midday sun due to the late start caused by another meeting with France Telecom. The problems are not yet completely at an end as, on looking through the small print of the sim, before I can recharge the little tyke I must send a copy of my passport and some other stuff to France Telecom. We resolved to start strolling much earlier today in order to have a cooler balinade. In Italy the bars open early so that people can have a quick coffee and brioche before setting out for work. 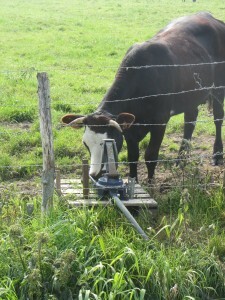 We wondered if the same custom operated in France. We arose at about 6:30am and, after washing and dressing, left our key and left the hotel on a bar hunt, we hoped that we would find a big one. The town centre wasn’t full but neither was it empty. Children were going to school and the baker was doing a steady trade with people collecting their bread, croissants and brioches. The bars were all shut so we decided to buy bread and a croissant and to then find a seat on which to sit and wolf down our purchases before getting started on the day’s adventure. Today has been the day of kindnesses. As we looked for a seat a youngish bloke, in his 20s I should think, came out of the door of the baker’s and, seeing our packs, wanted to know what we were doing and where we were going. After a little while he said “Avez faim?” We said “Oui.” He then said “Don’t move, stay here.” He went back into the baker’s and came out with a bag containing 3 warm, fresh, brioches. He bade us a cheery “Bon chance” and we parted. 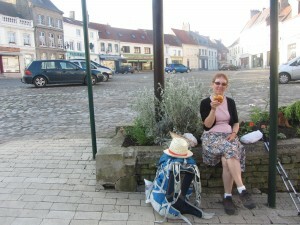 We eventually breakfasted sitting on a low wall in the town centre. The brioches were perfect and we made very short work of them. In order to get to today’s destination we were looking forward to our first taste of a GR, a grand rendonner. As Ardres retreated behind us the road became narrower and we stopped to consult our map to make sure that all was well. A chap stopped his car and gave us heaps of useful advice about roads and paths. Eventually we found a small wooden arrow pointing towards a track in a field, we had found it. The GR felt very much like the long distance routes in the UK. Strolling among the fields and over hills is what we really enjoy and we had it in abundance today for the first time since arriving in France. It is quite obvious how much further along the seasons we are here in France. We approached our destination, Tournehem-sur-la-Hem, looking forward to some lunch and getting our bed for the night arranged. We were early and found a nice cafe for a beer and a sandwich. As we ate and chatted to Mme Doyer, we asked her if she knew of anywhere to stay, she told us that there was an hotel and a chambre d’hote. Something to keep us going for a minute or two. Second kindness coming up, Mme Doyer rang both the hotel and chambre d’hote without being asked but had some disappointing news for us. There is to be a basketball competition this weekend and all of the rooms in the town were full. She said that there was a chambre d’hote in the next village which we could try. This news came as a bit of a blow but, fortified by jambon, fromage et biere, we set of into the unknown and the, by now, hot sun getting hotter by the minute it seemed. 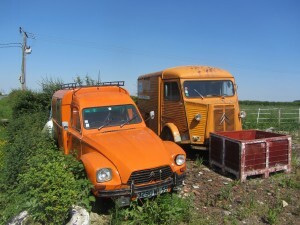 On getting into Bonningues-les-Ardres we sought out the chambres d’hote, nowhere to be seen, despair. We found a tabac which doubled as a bar and was also a place where vegetable seeds could be purchased. The lady behind the counter served us our beer and we asked if there was a chambre d’hote in the village. It was at this point that our language skills started to fail. The only way to understand the directions was to draw a sketch map. Leaving our bags behind us we set out once more, sketch map in hand, hopes not too high but, where was this chambre d’hote? In desperation we stopped the only person we could see, a man in a smart business suit, to ask where the place might be. He seemed delighted that we were British and took us straightaway to our destination. 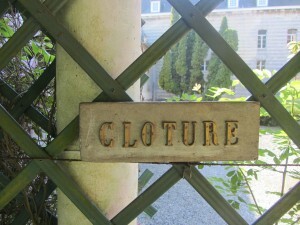 Le Manoir, a very grand house set in its own grounds with an imposing entrance. We feared that it would be another bust as madame looked to be very busy. The man in the suit greeted her and explained our situation. She had a room! Would we come back a little later? Of course we would! We had an enjoyable conversation with a chap back in the tabac, not too sure what it was about but it was obviously friendly as we all parted on good terms, shaking hands and being patted on the back. Le manoir is lovely, we arrived and slept for an hour or two then went down to dinner. 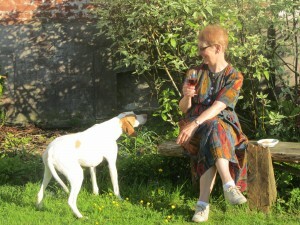 We enjoyed an aperitif made by the proprietors, blackcurrent, ginepre and cider, delicious and drunk sitting on the lawn with occasional visits from the dog. We dicovered later that madame’s brother had a farm and that the beef we had been eating was charolais crossed with blonde acquitaine, home produced and delicious. We wandered about quite a bit today so the map goes all over the place. Lets hope we don’t have to call on the priest for sanctuary tomorrow night. Despite everything I said about not calling on the priest for a bed for the night we slept on the 27th May as guests of the monks at the Benedictine Abbey at Wisques. After having bade a fond farewell to our hosts at Le Manoir we set off to find the trail for today. 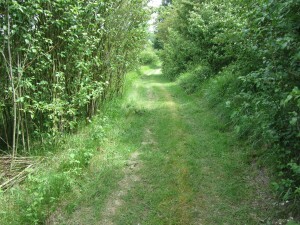 At first it meant a stroll down a quiet country road before getting onto a true footpath once more. Not all of the footpaths marked on the map exist but the majority do and are marked so we could stroll at will. A roof, somewhere in France. Today has been truly glorious for strolling, the sun has continued to shine and a cooling breeze has kept us company when we needed it the most. 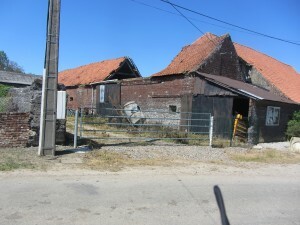 We aimed for Quercamps first, a small village where we were hoping to find a bar or a bakery for a lunchtime break. We found the bar immediately and went in. After getting a beer we asked if it was possible to have some lunch. The madame said that unfortunately this was not possible. In desperation we asked if she had any packets of crisps as by this time we were each thinking that biting a lump out of the other’s leg was a distinct possibility as a reasonable means of refreshment. Our difficulties increased when we tried to describe a packet of crisps, something made out of potato, something thin, something fried? We found a crisp packet in one of our rucksacks as a demonstration model and now we know the word for crisps in French. We had a bit of a chat with the people in the bar and suddenly madame appeared from the backroom with a plateful of pate sandwiches, delicious. This was later followed by ice cream and tea and coffee. Janet became friends with Patricia who introduced us to everyone and madame became Georgette. 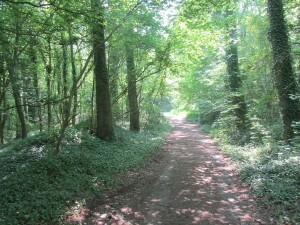 We eventually decided that we should move on and succeeded in finding the path to Wisques and to the Abbey. We were welcomed by the hospitaler and shown to our room. The Abbey is very beautiful and we discovered that there were two other people in retreat. We ate a good, simple, supper together and, using a mix of French and English, each told our life stories and how we came to be here in the Abbey on this day. Day 53 brings a challenge, no map. We arose in our monastic simplicity this morning and went down to breakfast at the Abbey. The rules of the order suggest that guests might care to eat breakfast in silence. We ate in silence, quite a challenge for us. After packing our rucksacks ready for the road once more we wandered about the abbey looking for father hospitaler in order to make our contribution for having enjoyed the short retreat at the Abbey of St Paul at Wisques. The father was nowhere to be found so, after talking to the other two people on retreat we put the contributions and a note under his office door. Today was always going to be a challenge as we had no proper map. All map shops seem to have been shut or did not stock the necessary maps we needed. We felt that we would have to manage with the sketch map picked up in a bar and the gps device. Being optimists we set off along the main road to Wizernes, which looked as thought it might lead us onwards. Stopping at a crossroads we peered left then right then at our meagre geographical resources. A chap stopped his car and asked us where we were going and did we have a map. He looked surprised when we described the journey we were intending to make and at the weak mapping we were using. He warned us to use a different road as the one we intended to use was dangerous. 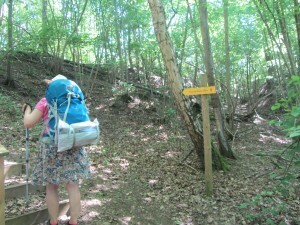 We appeared to be managing quite well without a proper map as the paths seemed to be going in the right direction. I decided that we shoukd consult the GPS to make sure that all was well when the little tyke told me that it needed to go to sleep as the battery was flat, no map, no gps, that made us feel flat as well. “Still.” we said cheerfully “Good chance this path will get us there!” We followed the signs along leafy lanes, through woods etc for quite some time. We felt that we must be near to our place of rest and confidently asked a passing cyclist how far from Aire were we. “About 8 Km” she replied cheerfully. We sat under a hedge and I got out the laptop and managed to recharge the GPS enough for us to get a fix. The cyclist was absolutely bang on we were going in the wrong direction and were 5 miles from our bed with an hour in which to get there. With packs and, in the hot sun, having already walked over 18 miles we thought that 5 miles in an hour without a map would be tricky. Thankfully the ‘phones were working so we could ring the hotel and seek advice. The receptionist was happy to leave the key and the fob for the main door in an envelope in the green bin by the main door, saved again. We decided to get a move on and stop strolling until we got to Aire. 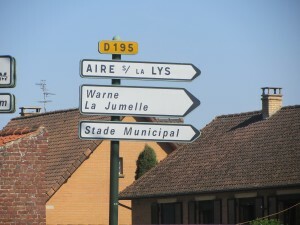 A woman in the square in a bar at Aire-sur-les-Lys told us where to find the hotel. After a while Janet zoomed off ay high speed, unburdened, and left me to nurse all our worldly belongings and a cool glass of beer. The map below is a bit odd as loads of detail is missing where the gps conked out. As it was a public holiday here restaurants were shut last night so we went to look for some supper. Near to the hotel was a sort of chip shop filled with eager chip eaters. The chips are served on trays, not little plastic efforts as in the UK but on enormous things that you could use to bring in the tea things, cups. saucers, plates, scones etc. 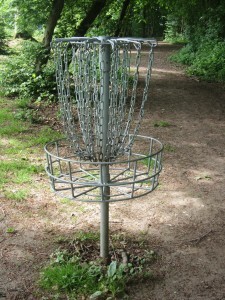 People had one each of these monsters in front of them! This morning we had a lie in after yesterday’s epic trek. I asked the receptionist if a map shop would be open today. She shrugged hopelessly and said probably not. We went out to seek breakfast and to find out if the map shops were truly closed, they were closed, as were most bars. 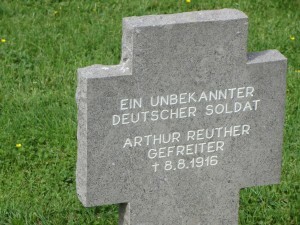 Decision time, go forth without map again and with little chance of getting one before Arras? Or stay here for another day, rest and listen to the last day of the Windies test? 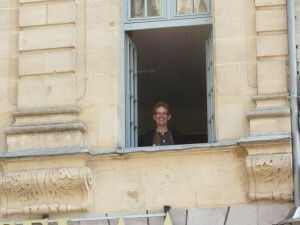 The clock in the Mairie has a carillon which plays a different tune on the hour and at each quarter. I think that I know the hour one but can’t remember its name. let ourselves out of the compound and then, on returning, let ourselves back in once again to our enormous but empty hotel. Breakfast this morning was generous and tasty. The receptionist was able to tell us that the shops likely to have maps would open at about 10:00am. Any hope of an early start was rapidly disappearing over the horizon but the receptionist’s hopeful suggestion that the local Carrefour had maps, and opened at 9:00 am, seemed worth a visit. Carrefour doesn’t sell any maps at all, not even roadmaps. So, “pooh” we thought. Janet legged it into the town centre as I bravely sat with a coffee and minded the rucksacks and stared into the middle distance. Once equipped with enough maps for the day we set off towards Lillers. 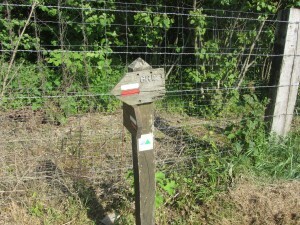 The French maps have a symbol which means that a footpath may exist but it is not guaranteed that it does exist. In an attempt to avoid a busy road we set out to use the footpath marked on the map. 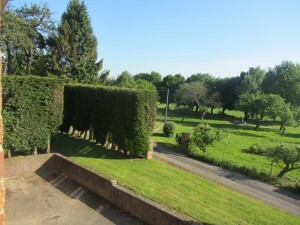 We strolled about for some time, passing football pitches and gardens and a place with a horse peering over a fence. The weather was warm and somewhat sultry today and we had only done a mile or two so it was quite disappointing to have to return to the road and use it anyway. Imagine our irritation to find that there was a nice pavement along this “dangerous road”. No need for the blessed path at all. Finding a brasserie for lunch proved to be an impossible task today. but we have learned to improvise. A roll or two from breakfast, a hard boiled egg, a bonbel cheese, a few peanuts, a coke bottle filled with warm water. 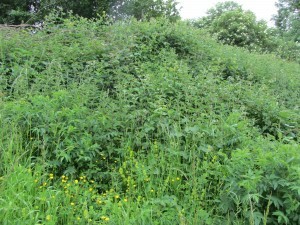 Tell me what is missing from that lot to make a fine luncheon, eaten sitting by a dusty track with nettles as companions. 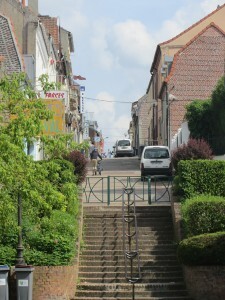 Lillers is a pleasant French town and it had a pleasant bar where we could slake our thirsts. There were two gentlemen standing at the bar who wondered what we were doing wandering about with enormous rucksacks. One of these chaps told us that he was a retired baker and had learned his trade in Paris. He told us that it was no fun working at night although kneading the dough made his hands soft and smooth and this delighted his wife. 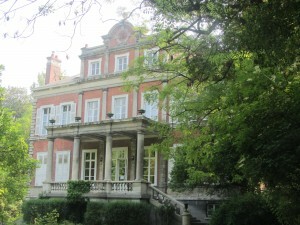 Being refreshed we had enough strength to find our accommodation, Le Chateau Philomel. 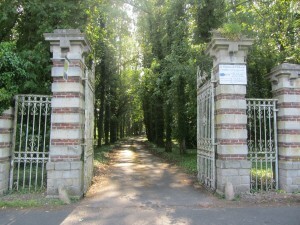 We eventually found some enormous gates and a long drive with a lake and an avenue of trees. We strolled up the driveway dressed in much the same manner as poverty stricken Dickensian characters. 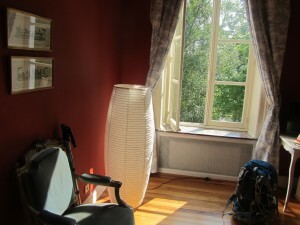 The house appeared and we found the owner who let us in to a very grand entrance hall, staircase and bedroom. We enquired about the other guests, how many etc. A pattern is starting to develop, again, we are the only residents. Again, the lights in the rooms are quite weak. 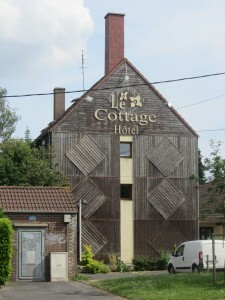 This seems to be a common thread running through accommodation all over the UK and, it seems, in France. In fact I’m writing this blighter wearing a head torch even though all lights are burning with all their tiny might. We have enough maps for tomorrow so our confidence knows no bounds. We can set out after breakfast to somewhere in France knowing that when we arrive it will be a place to which we have been heading. As we were eating our breakfasts this morning I asked our host casually about the chateau. He said that his great grandfather had bought the chateau but that its claim to fame was when it had been the HQ for the British in 1915 where the plans were laid for the battle of Loos. I suspect that we will be reminded of past conflicts on many more occasions as we move through this part of France, Vimy, Arras etc. The weather forecast, in fact, was good for strollers today, misty and cool to start with the possibility of thunder later. We could see that it was possible to start our stroll along a quiet country track and thus avoid a major road and its traffic. 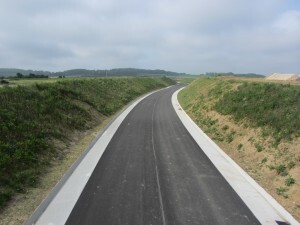 This track would then lead over, or under, the very busy autoroute A26, down which we have travelled on more than one occasion to Italy. The coolness of the air meant that we were walking at quite a pace compared to the last day or two and we were in high spirits, singing snatches of silly songs. It was certainly a surprise when we found a barrier across the track over which we were tripping and tripping came to an end. 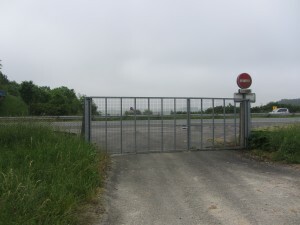 When we retraced our steps and used the bridge, provided for the use of motorised vehicles, it quickly became apparent why the French authorities had been so cautious in providing such a secure closure. I hope that I would have been in possession of enough self control not to have set out to cross this mighty tide of traffic if the barrier had not existed. 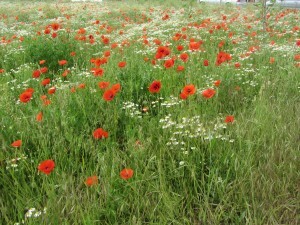 The first sight of poppies after this morning’s conversation with our host caused us to pause for a moment or two. Finding a footpath which would carry us through a wood after having walked by a busy and narrow road was a real pleasure as the weather was getting warmer by the minute and showing no sign of thunder or rain. Leafy glades in photographs all look the same, this one is really not one I made earlier in England. The shade was more than welcome by this time although insects were beginning to find our British persons interesting as possible sources of nutrients. Before leaving Old Blighty I took the precaution of buying some industrial strength insect repellant which actually had the desired effect and kept the little beggars at bay. The instructions said that the stuff was very effective but that the smell was fairly offensive. There must be more about me that is odd than I had previously thought as I find the smell unusually attractive. 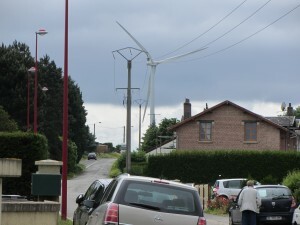 We arrived in Bruay-la-Buissière in plenty of time to relax before supper but had no maps for the morrow or an internet stick that could connect to the internet. 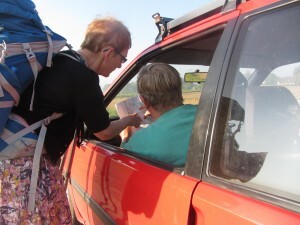 The receptionist suggested that maps could be bought in town, a mere 1Km from the hotel. I did get the stick fixed in town but all likely looking map shops sold no maps. Turning around we went in the other direction and walked back 1 Km then walked another to an out of town complex, maps aplenty, we can walk again tomorrow. As we were tucking into our croissants etc this morning I was a little disappointed to see a Frenchman at the next table receive a plate of bacon and eggs. Had I known that this option was available to me I would have requested it for myself. We managed to get away quite early this morning in order to get a good start on what could have been a longish day. The wheel and map suggested that we needed to walk about 15 miles today so we didn’t want to waste any time loitering without any intent. As we were walking out of Bruay we were stopped by a French woman who asked us why we were walking through Bruay. She had done the pilgrimage to Santiago and so was interested in why we were doing our trip and seemed surprised that Bruay might be involved. 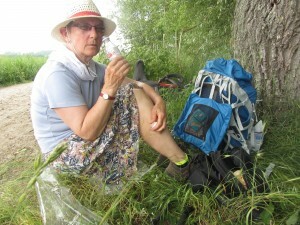 She offered us tea etc and it really was a great pity that we had just met this morning as her local walking knowledge was obviously vast. 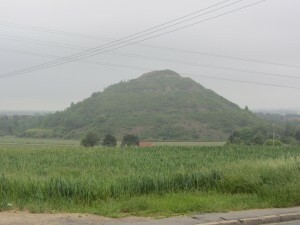 On the outskirts of the town were the slag heaps. They are quite imposing and we could see that they were being developed, one having a new vineyard starting to grow on its slopes, others having trees etc growing thickly on their slopes. The weather was cooler today and much more pleasant for walking so we were able to keep up a fairly brisk pace for most of the day. The countryside here is much more interesting than it appears from the seat of a car travelling south at high speed and we have enjoyed today very much indeed. Passing through a small wood we could hear the unmistakable sounds of a school field trip. A green open area revealed groups of scholars obviously being prepared to complete some woodland activities and having a great time. It was here that we spotted some strange objects made of metal and having chains hanging down from a top ring. Could they be plant pots? As we were drawing near to Aubigny we spotted a track which would take us there in a fairly straight line and which avoided road completely. We set off down the track and were very pleased to discover that someone had spent quite a lot of time and effort in making the surface hard and dry. Brick ends, bits of old ceramic tiles and other hard debris had been layed down making the path a pleasure on which to walk. About 50 yards along the path it went into a field and stopped at a fence. No problem for us because we could see that this was not really the path. 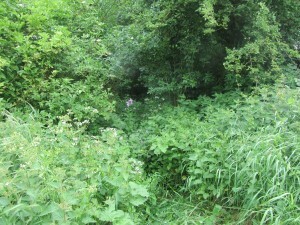 The real path went into a narrow cutting overgrown with trees, bushes and nettles. 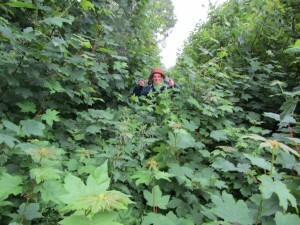 Undaunted by this trifling difficulty placed in our way by a cruel nature we put on our wet weather gear in order to ward off nettle stings and flying insects and plunged headlong into the green unknown. After some 20 yards the vegetation lessened in its intensity and the way became much easier for us to follow. It was all the more disappointing then to find the path blocked by a fence and a large pool of water and sludge. Ah well! Nothing to do but look at the map and go back. This slight set back probably only added an extra half a mile or so to the stroll so it was an irritant rather than a disaster. Before leaving Shropshire we remembered that one of our neighbours, John Hart, had ordered an unusual French local dish which was a sausage containing intestines. Being fairly sure that we would not enjoy this any more than he had done we asked Sheila Clarke, our French expert, what this potent dish would be called on a menu. Tonight at supper one of the items was l’andouillette, phew, thank goodness we asked and remembered. 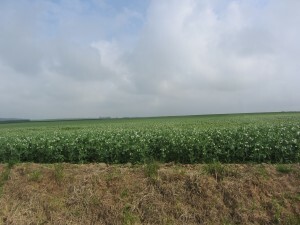 A huge sea of developing peas. Lovely day for a stroll today. The weatherman suggested that there might be a few sprinkles of rain, but he was wrong. 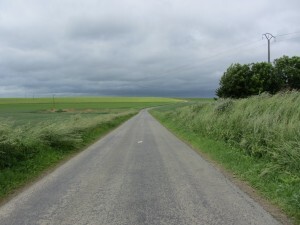 The road we took was a bumpy track and free of traffic and we strolled along it at speed and with delight. We could see on the map that there was a possible path which would cut off quite a chunk of busy road and, despite the occasions when this has not worked, we resolved to have a look at it. The map indicated that the path might end in the middle of a field and that it started in a farm yard. We got to the farmyard and there was what appeared to be a footpath sign so we followed it into the farm. We could here lots of shouting in a loud and hoarse French voice and a farmer appeared and suddenly started running up his shed still hoarsely shouting. 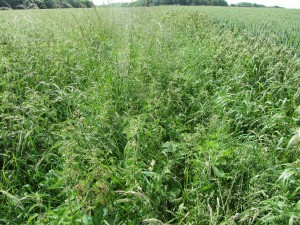 I suggested to Janet that we could ask him about the footpath, did the path carry on through the field perhaps? On balance her advice that he might not be that interested in footpaths at the moment was probably wise. 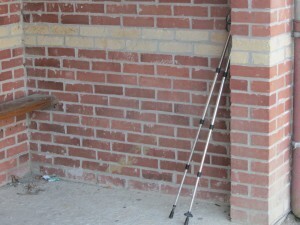 We could hear him still shouting long after we had left his property by the footpath that continued. I would really like to know at what he was shouting. We started out a little earlier today and by 11:30 were feeling a little peckish. 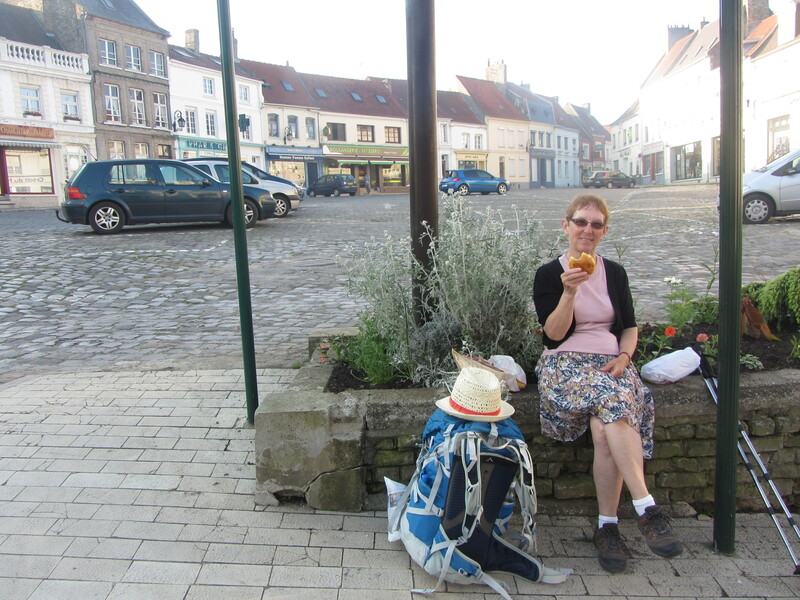 We had bought a camembert in Lillers as emergency rations and I had been carrying it around for a day or two in the warmth of the French sunshine and in the warmth of my rucksack. Last night it had become necessary to put the little beauty by the bedroom window with the window open, even though we were afraid it might make a bid for freedom. So, at 11:30 we found a shady tree in a village by a church with a comfortable wooden seat and opened the camembert, it was perfect. 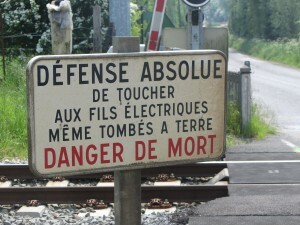 Lots of rural railway lines in France have nothing to prevent members of the public strolling down to them and crossing them. I like it, it makes me think that the authorities believe that I can think for myself. 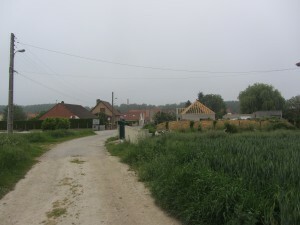 As we got nearer to Arras we could see the beginning of houses and new housing estates. We had been following a GR but we lost the thing completely at some point here. I have an electronic 1:50000 map and Janet has a paper 1:25000 map and none of the new developments were shown on either of these maps. 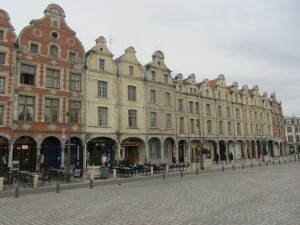 We did know that a prominent building “The Beffroi” was just a few minutes from our hotel but we couldn’t see it. In addition wandering around the housing estates had not improved our sense of direction. I found our position using the gps and then found the position of the Beffroi, then plotted a straight line between the two and attempted to keep us more or less on that line. 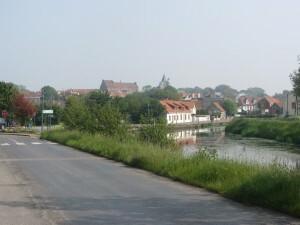 It was a great relief to see the Beffroi in the distance. To be honest the relief was even greater when we actually got to the thing. 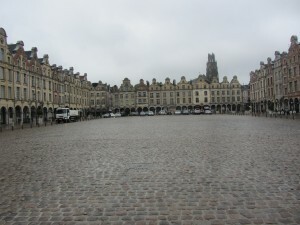 The square on which we are staying is very lively and is lined with load of bars. Also it is a real pleasure to listen to the carillon which plays before the hour is struck. Tomorrow is our anniversary so a day off and a good dinner I hope. Our host has an uncanny resemblance to Herbert Lom and I find this quite distracting as I eat my breakfast every day. As we had made very little forward provision for our accommodation, we had to move rooms this morning, up to the third floor. When I had finished packing my stuff Janet was fairly keen to have a clear run at doing her stuff without me tapping my fingers and cracking my finger joints so I went out to look at what was happening in the square. 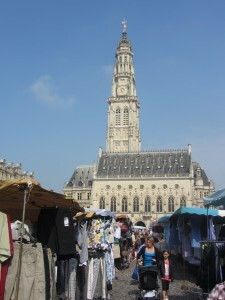 It was very interesting to look at the enormous street market which was getting itself established. The stalls contained all manner of things from small home grown vegetable and home made sausage stalls to large outfits selling meat, cheese, clothing etc. A wonderfully colourful sight with thousands of people cramming into the square and little roads which run from it. 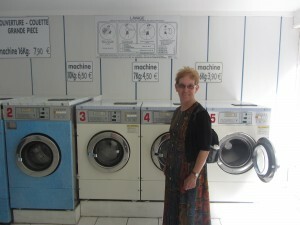 We had been told by a laundrette person in Dover that some Australians had not been able to find a laundrette in France and so had had to wait until they got to Blighty to wash their clothes. Well, we have seen loads of the things in every town. This morning we set of eagerly towards one of these frequent laundrettes to get our smalls and bigs clean. I’m not too sure from where France gets its reputation for good regional food. In every town and village we have visited so far getting a plate of food without a massive portion of chips has been impossible. Last night the starter was a bowl of crudities so the first veg of this leg of the trip was eagerly devoured. 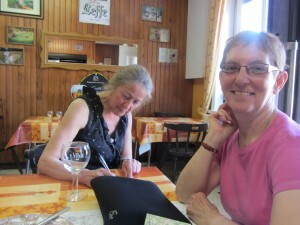 We spent part of this afternoon in the tourist office trying to find out about the next leg of our trip. The girl behind the counter suggested that there were only fields where we want to go. 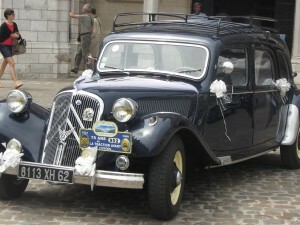 As we came and went into the tourist office we saw two wedding parties going in and coming out of the registry office. Quite nice to think that they and we all share the same anniversary date. 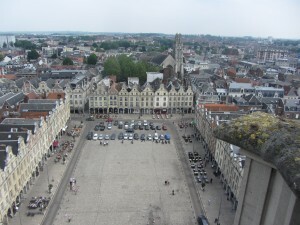 A high spot was a trip up the Beffroi on the Mairie. One ascends partly in a lift and then up some open stairs which then finally open out onto a narrow balcony with a stone parapet. 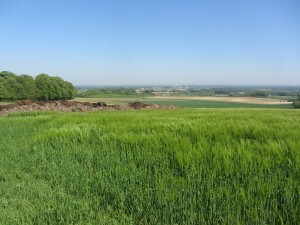 The views over Arras are wonderful from this point. I had a squeak of surprise when a local mother raised her child up to the parapet so that he could look over the top. In order to avoid chips, tonight we ate a pizza. One would imagine that a pizza would taste the same wherever made but tonight’s pizza was definitely French. For most of last night, at least the parts of last night when we were awake, we could hear the rain falling onto the roof next door. On waking this morning it looked as though it might continue to rain for most of today, as had been predicted by both our host and the TV. We finally poked our noses out of the hotel doorway at about 9:30am and discovered that the rain had stopped and that the cobbles were shining in the weak sunshine. Damp cobbles but dry air. Unburdened by rainwear we strolled across the square on the first steps towards Achiet. 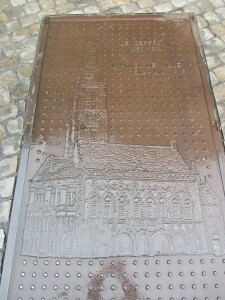 On the corner of the square we could see an ornate drain cover in the middle of the road so went to look at it. If Janet hadn’t jumped smartly out of the way a passing motorist would have been startled to find a British tourist, of the female pursuasion, clinging to his windscreen wipers. At this point the rain started again so we huddled in a shop doorway and dressed for rain. 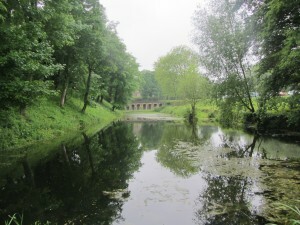 It was our intention to follow the GR for the first mile or two today and we discovered some lovely areas of the city. 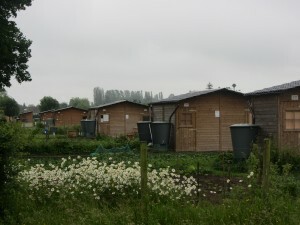 The inhabitants of Arras are obviously keen producers of vegetables as the area devoted to allotments appeared to continue for at least half a mile, probably longer. We now have conclusive evidence that French people like vegetables so why do the restaurants not serve up these inexpensive treasures for us all to enjoy? Loads of turbines, at least 20 anyway. We have had a wonderful stroll today as we have managed to avoid busy roads and, after the first mile or two, we had no need at all for rainwear. Indeed the weather has been nearly perfect for us, overcast, breezy, not too cold and not too hot. 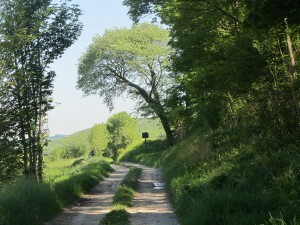 The peaceful road down which we have walked today. 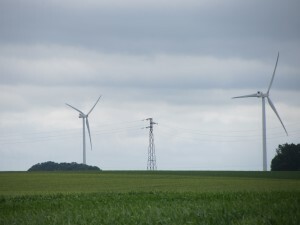 This open, sparsely populated, countryside is filled with an abundance of wind turbines and all of the infrastructure which is its inevitable accompaniment. French people seem quite content to live in close proximity to all of this stuff. As I have mentioned before, each village or town here has a powerful reminder of the past. Courcelles-le-Comte An ossiary for 275 unknown French soldiers of WW1 plus crosses of those whose namex may be known. 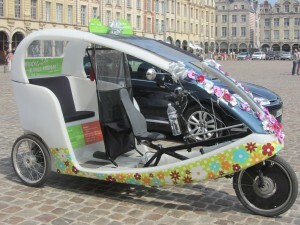 Tomorrow we will be heading out for somewhere else in France. Our lunch is chilling on the window ledge . When we set out on this adventure we made several assumptions. Some of these assumptions have been proven to be utterly wrong, both in England and in France. One of these assumptions was that we would be able to find a reasonable amount of accommodation in rural areas. This lack of accommodation has increased the length of our strolls and introduced peculiar meanderings into them as well, although it has led us to places which we would never have visited but for the need to sleep in the dry. Another assumption, limited to France, was that it would be relatively easy to buy 1:25000 maps in order to ensure that our daily strolls were no longer than we wanted them to be. 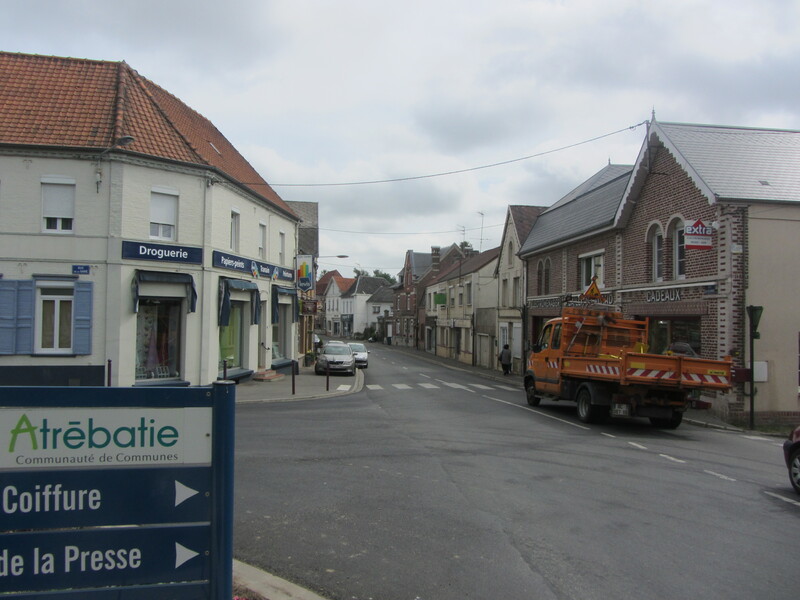 We left Achiet-le-Grand this morning in a fairly stiff breeze and quickly had to respond to a shower by donning our wet weather gear. 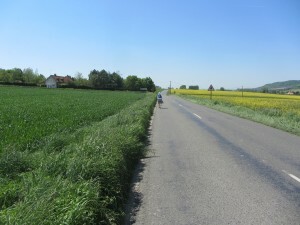 We then headed at some speed towards Bapaume as we did not have a map for the last bit of the trip to Rancourt. 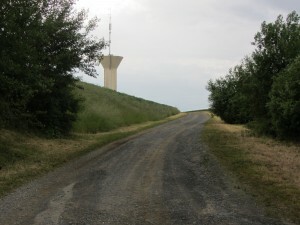 We knew that there was a disused railway line and that it ran straight to Bapaume so we set off down the thing with great enthusiasm. 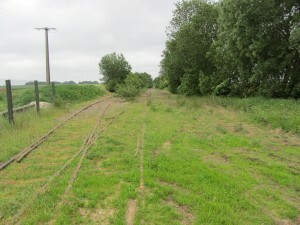 The disused railway line from Achiet to Bapaume, we thought that it was active until a day or two ago. At the beginning of the line the tracks were in good condition and the ballast was free of vegetation so we made modest progress in some comfort being away from all traffic. 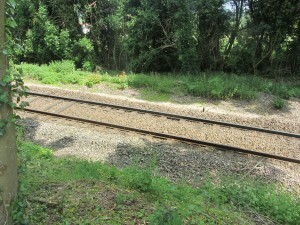 The railway is disused by man but very much used by nettles and sycamores. Further along the going became more difficult. 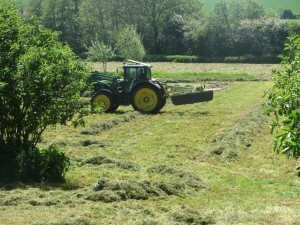 With a couple of parangs to swat away the lush vegetation we would have made better progress. 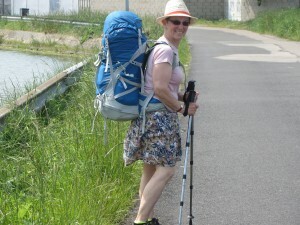 Not having any parangs tucked away in our rucksacks we were obliged to leave the railway and use a footpath instead. We were becoming a little anxious by this time that the map shops, if they existed, would be shut for lunch. 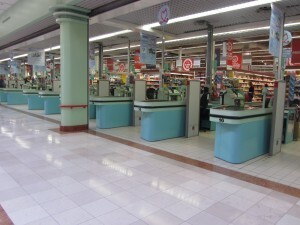 We have discovered that Carrefour markets sell the maps we need and that there was one of these in Bapaume. On arrival we tried to get into the shop, the doors opened but the staff told us that they were closed on Monday. What to do now? A group of boys sitting outside tried out their English and told us where we might find an open shop. What a relief when we got to the shop and it was open and it had the maps we needed.The owner gave me his card in case we needed him, he is also a taxi driver. Feeling a little peckish by now we sat on a bench in the park in the rain eating our saucissons, crisps and lettuce. 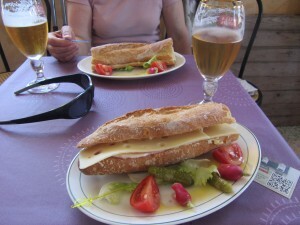 a delicious repast followed by a glass of beer in a bar. As we stroll around the countryside we keep encountering plies of clay. 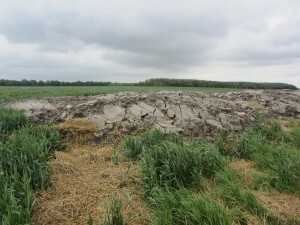 These piles are dumped on field edges and appear to be abandoned as the crop in the field grows around them. 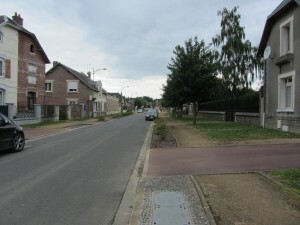 This part of France was described to us by the tourist information lady at Arras as being empty, just fields. 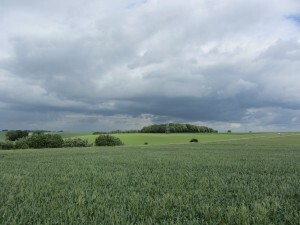 In one sense she was quite right, the landscape does largely consist of large fields of arable crops which are like seas of green. Intermingled with these green seas are tiny villages connected by the lanes and footpaths we use to move south from day to day. Most of these little villages no longer have a baker or butcher and now rely on deliveries from larger towns. 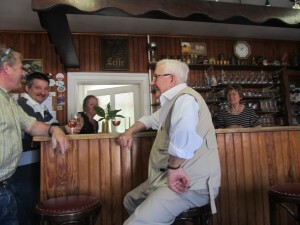 At least some of the villages still seem to have a bar tabac, thank goodness, which is a great place to sit and relax and to chat. The room we have for tonight is quite pleasant and the bath was fabulous. The restaurant was a bit odd though. We asked for a table and sat down. There appeared to be one waiter only who seemed to be incredibly inefficient. He brought us a menu of huge pretention and price then left us. Other diners entered and were seated and received their menus. In some sort of ritual known only to him he brought out the bread rolls and gave them to just one table. Then disappeared for a little while. He then returned and gave bread rolls to another table and disappeared. He took a drinks order from one man and ignored the rest of us and so on and so on. we finally went into the bar in despair and discovered that the waiter was the barman as well. By this time we were becoming a little tense and decided to go to another restaurant. There being no other restaurant in the village and we, having no means of transport, retired to our room and ate the remnants left over from our lunch. It was delicious and strangely liberating to have eaten some food despite the best efforts of the retaurant to prevent it. 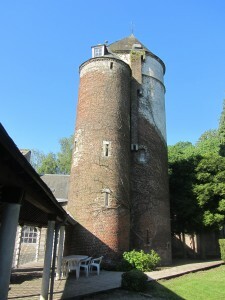 Tomorrow we go on to Péronne. Today has been a perfect day for a stroll, with the extra benefits of lovely countryside and hardly any need to use busy roads. 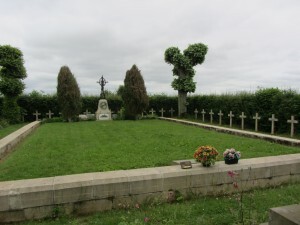 We see war cemetaries everywhere here, some large some small, but usually French or British. The events of the past are recounted in compelling detail on plaques and on memorial stones in every village. Not all of today’s stroll was plain sailing. For most of the day we were able to stride out and just enjoy the fields, the smell of flowers, and hedgerows. We ate our lunch lounging drowsily in the sun to the sound of the cuckoo and the lark. This was what most of today was really like. Where is the Somme though? Surely, it must be here somewhere? The Somme looked enormous on the map and we found it strange that we couldn’t see it, even from a distance of less than half a mile. When it finally came into view it was huge. 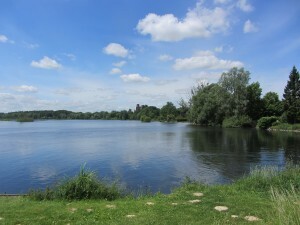 A series of sluices, canals and locks have been used to create a series of huge lagoons used for fishing, boating etc. 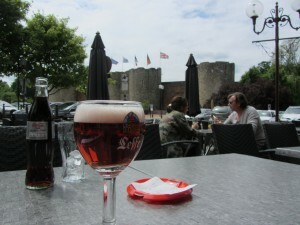 The Citadel of Peronne through a beer glass. As the days have gone by we have become fitter and in order not to become too smug about this we have bought some extra stuff in order to add weight to our packs. We now have a dictionary each and I have a new day sack. Janet has ordered a new kettle from Amazon, allowing us to have a nice cup of tea every morning with the added bonus that Janet can fill her hot water bottle. Today’s stroll was a little longer than usual being about 20 miles long. 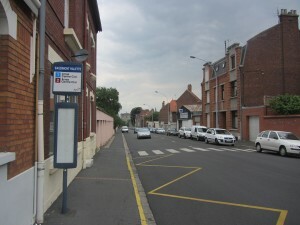 Before leaving Peronne we went to the pharmacist to buy some more Vaseline. My walking friends will testify to the importance of Vaseline to the long distance walker. I had lost my supply and was feeling nervous at its loss. As soon as I purchased the new supply the old one appeared of course. A significant part of today’s stroll took place on an old roman road but in order to get to this ancient chariotway we had to follow ordinary footpaths through open countryside. The overnight rain had made some of the paths a little troublesome but they were, for the most part, an easy option. A bit wet but passing farmers slowed down as they went through the puddles. After some 10 miles we were closing in on a village for some refreshment. the path was obvious and was clearly marked on the GPS and on the walking map. 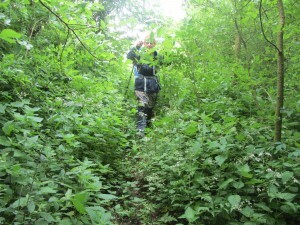 It was a little distressing to find the blighter blocked with saplings and a thicket of nettles. 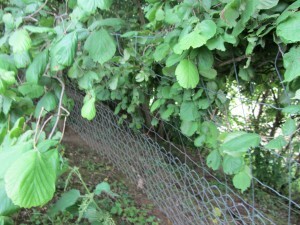 We hunted about a bit and found a fence over which we could climb. Janet hopped over first and swung upside down on the netting, ho ho I said. 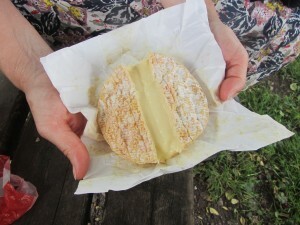 This process added at least half an hour to our stroll as we sat down and consoled ourselves with cheese. On closer inspection of the path we could see that the thing had been moved and that there was an easy, neatly cut, path which we could have taken if it had been on the maps. We arrived at Vermand with ferocious thirsts and eagerly hunted about for a bar but all were closed for Wednesday. 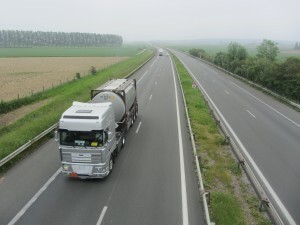 As the approaches of St Quentin drew near we could see a mighty motorway between us and St Quentin. My map is out of date and showed no crossing. Janet’s paper map showed that it might be possible to cross but after our earlier experience we were a bit nervous. After 19 miles of strolling we didn’t really want to have to find another way around this obstacle. The map showed a tunnel but we were climbing up a hill and were at the same height as the motorway. We whistled happy tunes and pretended that everything was just fine and that if the path stopped short then that was absolutely alright in the great scheme of things. The path twisted and turned as it descended and refused to yield up its secret until we were upon it, the tunnel existed, we should go to the ball. We are staying in an hotel which is part of group. 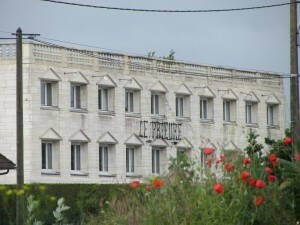 The hotel is called Premiere Classe, this obviously has a different meaning here in France to that which one might expect it to have as a foreigner.